Due to the skills and proficiency of experts, we are enormously praised for providing a superior quality of Humidity and Temperature Sensor to our valuable customers. These are NTC thermistar based devise used for giving low power temperature signal in Automotives. These are made in brass construction in different sizes. These are used in automotives for dash boards signals, fuel temperature sensors air conditioning units, air Temperature sensing etc. Running with an objective to acquire maximum level of customer satisfaction and trust, we are involved in manufacturing and supplying a distinctive assortment of Temperature Thermocouple. Being a quality-oriented enterprise, we are engaged in manufacturing a broad gamut of Thermocouple Probe Sensor. - For measuring the temperature and convert the temperature gradient into electricity. With the aid of our experienced workers, we are devoted towards manufacturing an exquisite range of Sensor Thermocouple. 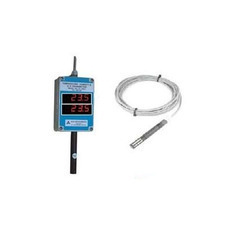 Backed by our expert and experienced professionals, we provide Temperature Thermocouple. We hold immense expertise in catering to the diversified demands of the customers by bringing forth an array of Flame Sensor. The offered range is manufactured in strict accordance with the global quality standards using superior grade raw material, which is sourced from the coherent vendors of the industry.